I recently placed an order on Walmart.com for napkins and a few other items. Seriously, I’m kind of obsessed. I order all sorts of stuff off their website. Toothpaste, peanut butter, detergent, lotion, cereal, socks, you name it, I’ve probably ordered it. 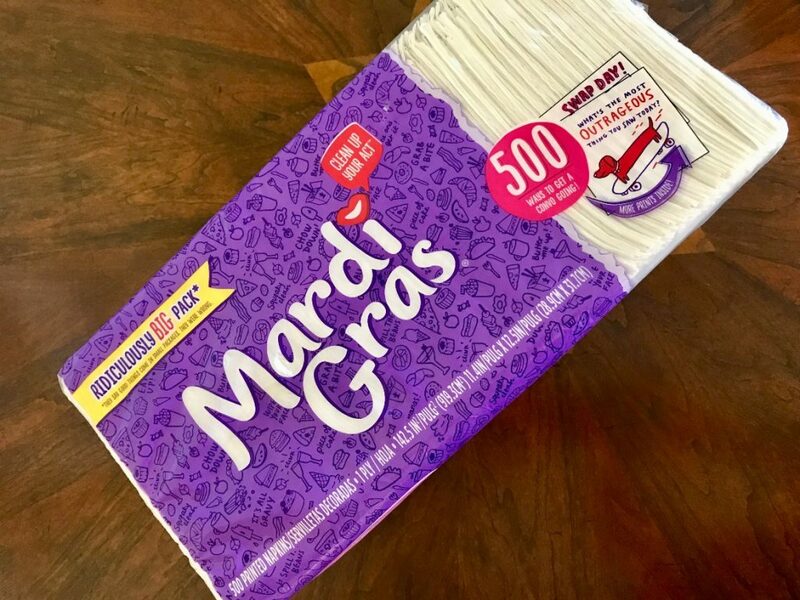 I did a quick search for napkins while on their website and ended up adding “Mardi Gras Napkins with Conversation Starter Prints” to my shopping cart. It was a ginormous pack of 500 for $4.95. That’s the main reason why I chose them. I wanted something affordable and large enough so that I wouldn’t have to worry about buying napkins for a while. 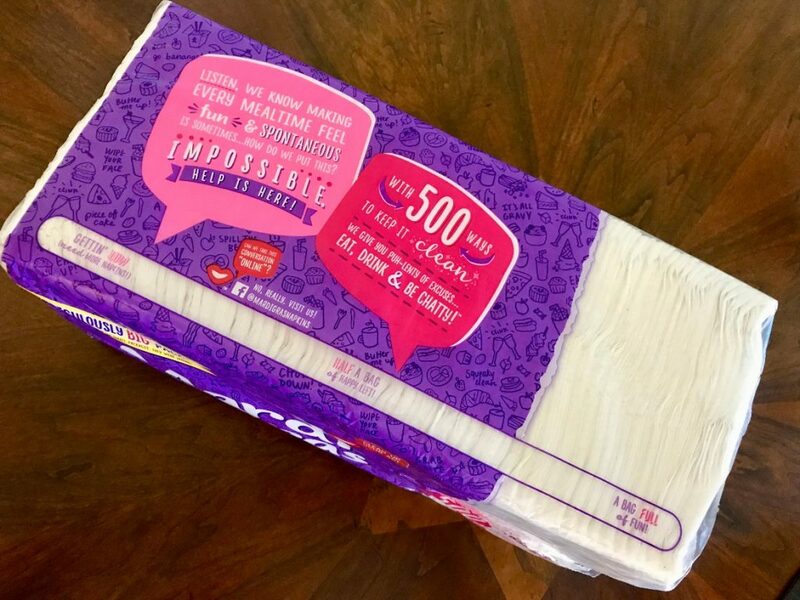 Now, you may be wondering why would I decide to write about napkins. Well, it’s because these square pieces of paper are different from your usual white napkins. For starters, their name says it all. They have fun conversation questions on each napkin, perfect for getting people to talk at the dinner table as opposed to starring at the TV or playing with their phones. Do people even sit at the dinner table anymore?? That reminds me, I should sit at the dinner table with my husband next time we have dinner together as opposed to on the couch. Anyway, along with questions made to get families talking, they also have adorable prints. Blue owls with glasses, roosters, and dogs on skateboards. The prints may be a bit juvenile but I think anyone can get a kick out of them. If you have kids at home, you should pick up these napkins. If you are young at heart like I am, you should pick up these napkins. Do you like anything that can put a smile on your face? Get where I’m going here. At first glance, you may think they are great for families with children but in my opinion, anyone can enjoy them. Hey, we’re never too old for something that can get us talking with each other, even if that something has a dog with a tie and suitcase drawn on it. What’s funny is that I ordered these napkins without reading the description. So when they arrived I was a bit confused. I wondered what in the world had I ordered. But I love anything that’s silly and has some innocent humor so it didn’t take long to figure out that I had winner napkins in my hands. As for quality, they are not exactly top of the line, premium, linen-like napkins. They are kind of rough and a bit on the thin side. Not exactly your “winner” type of napkin, right? But I have to admit, I’m not a very picky person when it comes to napkins. As long as they can wipe the melted chocolate off my fingers from my chocolate chip cookie snacks and get the grease off my lips after a delicious fluffy white rice dinner (I’m Dominican so white rice is usually the main course on most days. I know, I know, I’m so lucky) it’s a good enough napkin for me and my family. My husband, on the other hand, is a bit pickier but as long as he doesn’t have to do the work to go to the store or search online he’ll use anything. Now, I’m not trying to say the quality is horrible, because it’s not. They don’t fall apart when I’m using them and like I said they get my hands clean. I just wouldn’t use them for more heavy duty things like wiping down my kitchen counter. Not that they are intended for that but let’s face it, some napkins are thick enough to do all sorts of tasks. These are not. That’s perfectly fine though. I’ll take a fun, down to earth, laid back napkin any day over a boring, colorless, no personality, expensive napkin. Did I just bring these napkins to life by giving them a personality? Ok, I guess that’s my cue to finish things up. 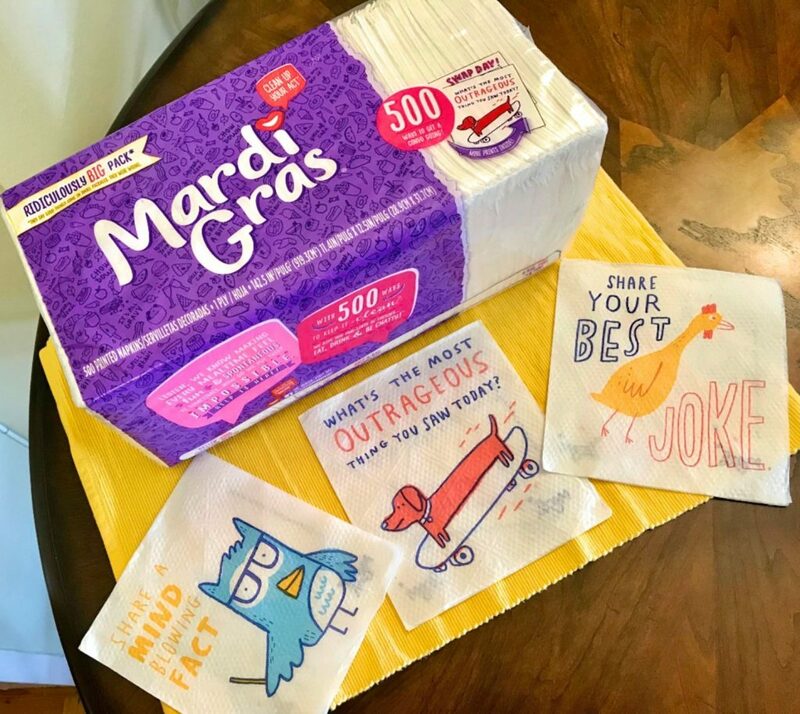 Here is a link in case you want to check them out: Mardi Gras Conversation Starter Napkins. The link is for Walmart but FYI, I did also find them on Amazon prime pantry. This is not a sponsored post. No affiliate links were used. I like to provide links to products I find that are similar or identical to products I have mentioned. I provide these links in case you would like to purchase an item or something similar to the items I use. I am not compensated in any way if you decide to click on and purchase any of these items. If at any point I do use affiliate links or write a sponsored post I will inform you of that somewhere in the post or right after the post. 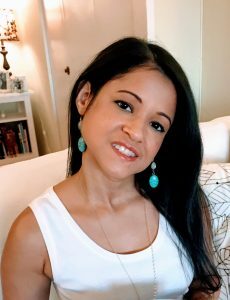 Thank you so much for taking the time to visit my blog. I hope you enjoyed it and decide to stop by again!